(VOVWORLD) - UN Secretary-General Antonio Guterres on Wednesday welcomed the outcome of the third summit this year between the leaders of North and South Korea. He called for concrete action to follow up on North Korea’s commitment to close a missile test site with international monitors present. “The commitments reflected in the joint statement include important military confidence-building measures and a commitment by the North to dismantle missile engine testing infrastructure in the presence of experts from other countries,” Guterres said in a statement. He offered UN help to advance efforts to fully rid the Korean peninsula of nuclear weapons and called for unity among global powers. US President Donald Trump welcomed the summit between North Korean leader Kim Jong Un and South Korean President Moon Jae-in, and said the US has made “tremendous progress” with North Korea in some fields, including denuclearization. Trump called the promise by Kim Jong Un to fully dismantle his main rocket launch sites “very good news”. Russian State Duma Foreign Affairs Committee Chairman Leonid Slutsky said the military agreement signed by the two Koreas “is a huge step towards peace and understanding on the Korean Peninsula”. The Chinese government expressed support for the latest set of inter-Korean summit agreements, saying the agreements constitute an “important” shared perception on denuclearization and other pending issues. Chinese Foreign Ministry Spokesperson Geng Shuang said at a press briefing that the two Koreas reached “new and important common ground” through the summit in Pyongyang on improving bilateral ties, reducing military tensions, and ridding the peninsula of nuclear weapons. Japan’s Chief Cabinet Secretary Yoshihide Suga expressed hope that the inter-Korean summit agreement will lead to complete denuclearization of the Korean Peninsula. Suga told reporters on Wednesday that the important thing is quick implementation of the agreement made at this year’s US-North Korea summit, including Pyongyang’s commitment to full denuclearization of the peninsula. After South Korean President Moon Jae In and North Korean leader Kim Jong Un held a two-day summit in Pyongyang, Suga said Japan will continue to closely coordinate its policy on North Korea with the US and South Korea. North Korea’s media extensively reported Thursday on a joint declaration signed by the Korean leaders. “Kim Jong Un noted that accelerating the progress of north-south relations so as to give steady continuity to a new era of national reconciliation and peace and prosperity was discussed in depth,” the Korean Central News Agency reported, citing Kim's remarks at a press conference on Wednesday. 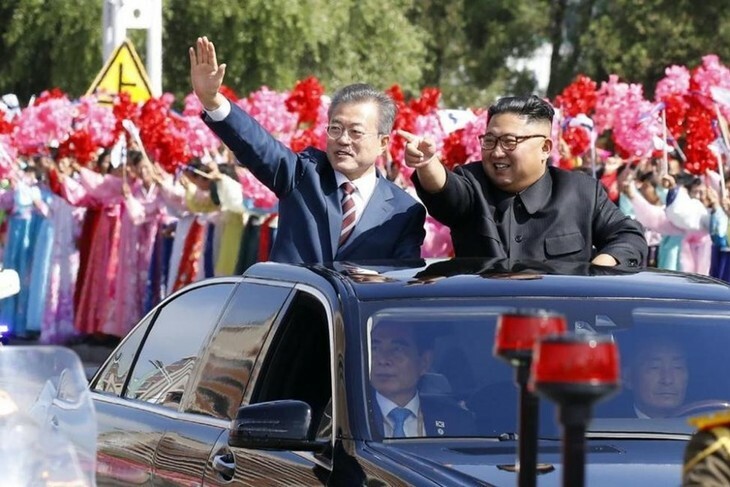 According to KCNA, Kim said the two sides discussed ways to comprehensively develop inter-Korean ties based on a principle of national independence.